Today I'm finally reviewing the comforter bubble bar. I have wanted to review this one for so long, so I'm happy that I have finally got round to posting this. This bubble bar is one of my all time favourite's from lush because I think the price is really good and the smell is just so lovely. I can normally get about 7 or 8 baths out of my bubble bar. That might seem like a lot but I like to make my lush products last. Also out of one piece of the bubble bar you still get a great smelling bath and lots of lovely bubbles. 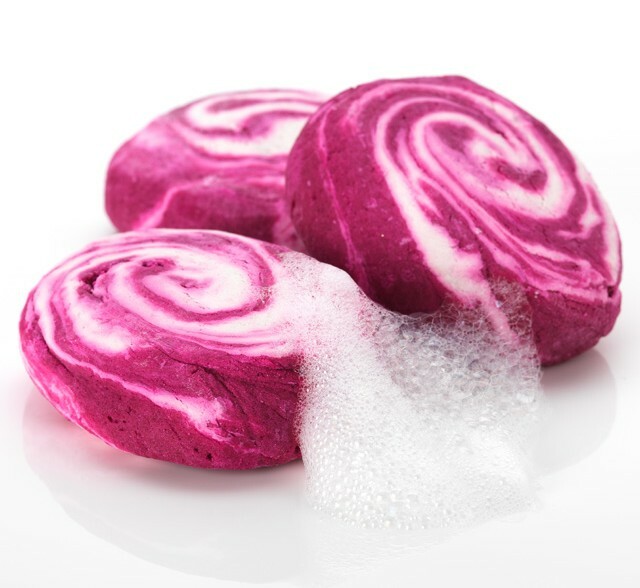 Here's what lush say about the comforter bubble bar "Sometimes you just need to shut yourself off from the outside world under a blanket of fruity foam that will put you back in the right frame of mind to face the world. This bar is supersized, so you’ll only need to crumble half a bar under your tap to make enough bubbles for a long, comforting soak. Cassis absolute gives a distinctive blackcurrant fragrance, while bergamot adds an uplifting note." Sodium Bicarbonate, Cream of Tartar, Sodium Laureth Sulfate, Lauryl Betaine, Perfume, Titanium Dioxide, Bergamot Oil, Cassis Absolute, Cypress Oil,*Limonene, *Linalool, Colour 45410, Colour 17200. I really love this product because it smells like ribena which is a black current drink we have in the UK. It makes the water a lovely soft pink and its the perfect product to help me relax. The smell isn't to overpowering and has a nice balance to it, to make it just right. The other thing I love about this product is that its not a seasonal one. I love that I can pop into lush at any time and get this bubble bar. I hate it when I find a product I love but I'm told its only for Christmas or Easter. I would highly recommend you all go and try this bubble bar. I guarantee you won't regret it. Have you tried this bubble bar? Let me know what you think of it.